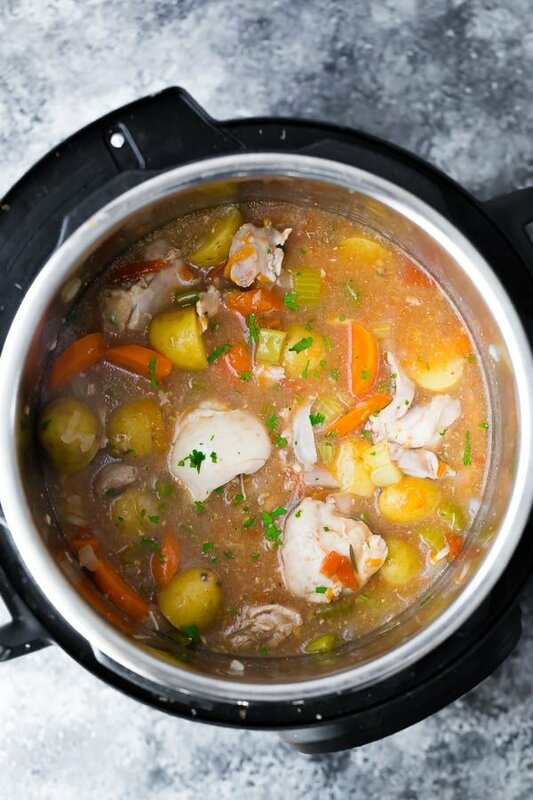 Instant Pot Tuscan chicken stew is heathy comfort food at it’s best! Full of veggies, with a boost of flavor from fennel seeds, rosemary and balsamic vinegar. Quick and simple to prepare, gluten-free and clean eating. If this Instant Pot Tuscan chicken stew looks and sounds familiar, that’s because it is! This Slow Cooker Tuscan Chicken Stew is one of my oldest and most popular recipes on Sweet Peas and Saffron. 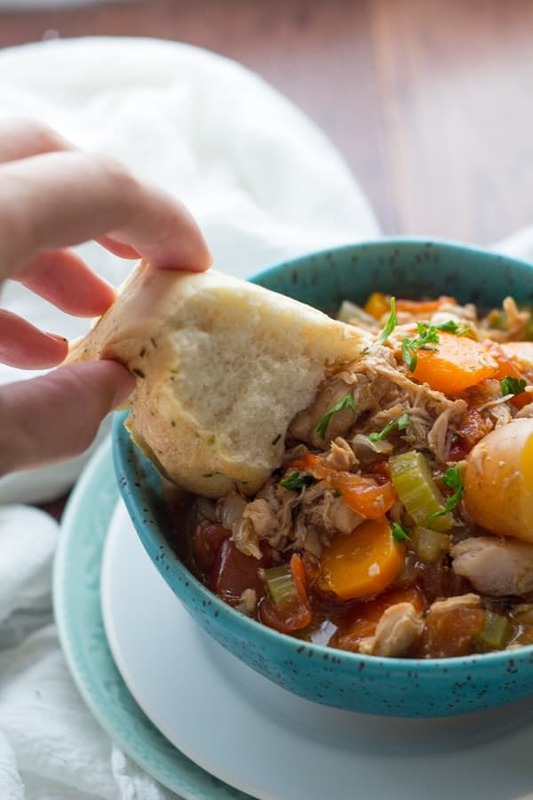 It was time to adapt it to the Instant Pot, because that means that we can enjoy this delicious chicken stew on weeknights. As much as I love my slow cooker, chicken recipes are really hard to prep when you work outside the house. 8-10 hour cook times are just not possible. That is one of (many) reasons I am loving my Instant Pot. You can have this Instant Pot Tuscan Chicken Stew on your dinner table in under an hour, and most of this time is completely hands off. Not only that, but this Tuscan chicken stew can be prepped ahead and stored in the freezer (uncooked), as a freezer Instant Pot recipe. This makes it perfect for expectant mothers, elderly people, or busy families. Just like the original recipe, this Tuscan chicken stew recipe can be prepped and portioned out in under 15 minutes. chop your veggies- dice up an onion and a tomato, slice some carrots and celery, and cut some baby potatoes in half (depending on their size). Note that if you are freezing, you need to keep your potatoes whole to prevent them from browning and getting a weird texture. 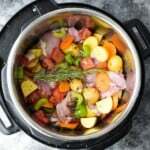 prep your chicken- you can use either chicken breast and chicken thighs in this stew recipe, however I recommend you cut off any excess fat. A little bit is OK but huge chunks = no. Also, avoid skin-on chicken as this will give you a super fatty stew. I used to cube my thighs but I don’t even bother now. You can shred it after cooking and that way you don’t have to deal with raw chicken! herbs & spices- fennel seeds: crush with the side of a knife to help release the flavor. Just toss a whole sprig of rosemary right into the stew. We are going rustic here! 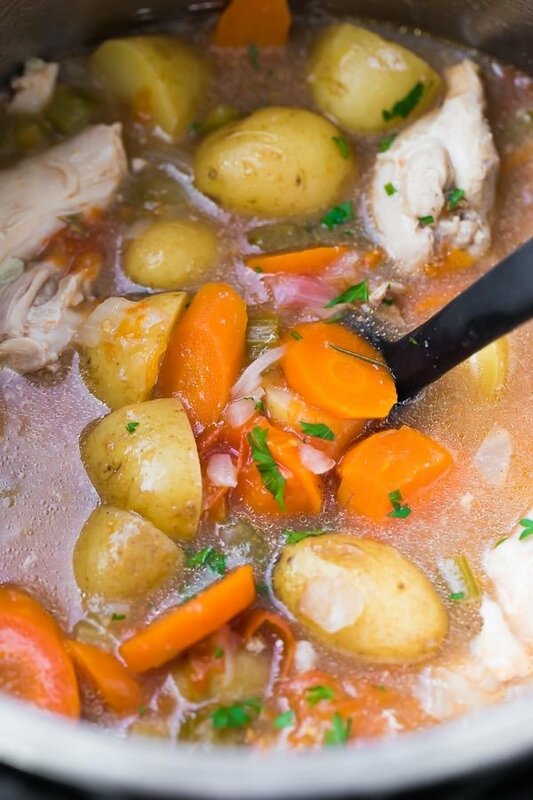 liquids- I use chicken stock in this recipe as well as a bit of white wine. The wine is optional and may be left out. cook! 10 min high pressure with a 10 minute natural pressure release. For chicken breasts you will want to reduce the cook time to 8 minutes. Remember that your pot will take time to come to pressure, around 20 minutes for this recipe. That takes the total cook time to 40 minutes. acid and thicken- add a splash of balsamic vinegar to brighten everything up after cooking, and some water + cornstarch to thicken. You can let it sit for a few minutes or you can put on the ‘sautee’ function to thicken. As the stew cools it will thicken even more, so don’t be alarmed if it doesn’t look thick while still steaming hot. Can you believe this Instant Pot Tuscan chicken stew actually tastes even better on day 2? It makes for a fabulous lunch the next day. You can also freeze the uncooked recipe as Instant Pot freezer packs. Make sure you keep the potatoes whole, and you can freeze everything for up to 3 months. To cook, thaw completely and cook as directed. 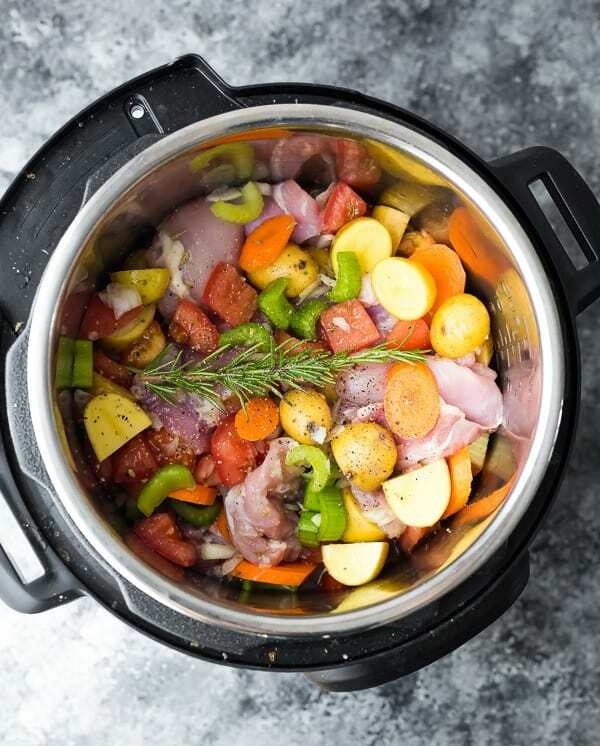 Instant Pot Tuscan chicken stew is heathy comfort food at it's best! Full of veggies, with a boost of flavor from fennel seeds, rosemary and balsamic vinegar. Quick and simple to prepare! Add all ingredients not labelled 'after cooking' to the base of a 6 quart Instant Pot. Set the valve to 'sealing', then cook on high pressure for 10 minutes. When the Instant Pot beeps, allow it to sit for 10 minutes (natural pressure release). After 10 minutes, release the remaining pressure in the pot. Stir together the water and cornstarch, then add to the pot with the balsamic vinegar. If stew doesn't thicken, set on 'sautee' for 5 or so minutes. Add all ingredients not labelled 'after cooking' to a gallon sized freezer bag. Remove as much air as possible, and freeze flat for up to 3 months. To cook, thaw completely before cooking as directed above. Someone asked for a SLOW COOKER or CROCKPOT adaptation. What would you recommend? You sent her your IP recipe again. Hi Tandi! The Instant Pot will take 20 minutes to come to pressure, and then with a 10-min natural pressure release the total time is 40 minutes. I just don’t want anyone to think this recipe actually cooks in 10 minutes. Hope that makes sense! I made this tonight, and it was fabulous! I halved the recipe as I have a 3qt mini Instant Pot, and it was great. I think I kept the celery and tomatoes the same but everything else I halved. Not sure if I needed to, but I did! I might try and make a full recipe as it didn’t come anywhere near the top fill line on the insert. So tasty, and as I’m alone I think it will provide 2-3 meals or a bit more… depending on if I have seconds! Will definitely make it again and again. The Balsamic vinegar is the secret ingredient that makes it pop! Made the stew for the first time tonight. It was delicious! I added barley to the recipe. I will definitely make this again. Thanks for all the wonderful recipes on your website. I had never done any meal prep ever, but now I am able to meal prep most of my meals each week. Thanks again Denise! I LOVE the idea of adding barley to this! I must try. Thanks so much for your review, Peggy! My husband is not a fan of carrots and celery. What other veggies would you recommend? Green beans? Mushrooms? Corn? Or would those defeat the “Tuscan”? That’s so tough! You could just leave them out. I think green beans would work in this recipe but I’d add them closer to the end of cooking. I have chicken breast but it’s not defrosted. How you you adjust the cook time? Hi Emily! That’s a great question and I haven’t tried. I would try adding 2 minutes onto the cook time, and check if it’s cooked through. If not, you can add a few extra min…the pot will come back to pressure quickly second time around! HI. I accidentally purchased bone-in thighs. Will you help with the cooking time difference? Thank you! Hi Ace! I think the cook time should be pretty similar. You can get away with cooking bone-in a bit longer than boneless. Just be careful there isn’t too much fat on your thighs or you could end up with an unappetizing stew. I dd not change a thing using bone in chicken thighs and it worked perfectly. I like your recipe a lot. I tweaked it a bit though. I used the sauted the onion, carrots and celery til translucent and added garlic for 1 more minute. I also added oregano to the seasonings. At the end of the cooking time I added a can of red kidney beans and white kidney beans (cannoloni) and fresh spinach to make it a bit heartier and the pop of green made it look amazing. Thanks! Sounds delicious! I like to skip the sautee step because this way I can assemble everything ahead and store in the fridge/freezer until I’m ready to cook. But sauteeing does add a bit more flavor. Am I doing something wrong. I just put this recipe together and it’s my first time using my instant pot. I can only program it for four minutes at a time. Does that make sense? Hi Denise! If you push the + or – buttons, it should adjust the cook time! Although if you have a different model than me it might be different. Are you using the 7-in-1 DUO? This was fantastic! I used chicken tenders, and cooked it for a little too long (15 minutes) but the chicken was melt in your mouth wonderful. I also used some home made roasted tomato sauce rather than the chicken broth and tomatoes. I also used thyme instead of fennel. Will keep this in my rotation. Loved it! Hi Kathy! I’m so happy to hear you enjoyed! I will have to try thyme next time! Thanks so much for your review. Can you use just s regular pressure cooker? Hi Roxanne! I have only ever used an Instant Pot, so I can’t say with 100% certainty, but I do believe it would work fine in a normal pressure cooker as well. I can’t wait to make this tomorrow night! How much boneless chicken breast should I use? One pound or two? Hi Jennifer! I’d use 1.5 lbs, roughly 3 large chicken breasts. Hope you enjoy! We don’t have many cold snaps in Texas, but we had a big one this week. This soup was perfect to make and fill our bellies! My teenage son LOVED it so much that he has warmed it in the mornings and taken it in a thermos for lunch the past two days. When I asked him this morning if he wanted the soup for lunch, I received a resounding “YES!” Thank you so much for sharing it! Wow, kid approval is the BEST approval! Thanks so much for taking the time to leave a review, Kimberly! Hi Eva! This should work fine in a 8 quart instant pot! Same cook time etc. Hope you enjoy! Hello, this sounds and looks like a very yummy recipe. I have a question though. The prep + cooking time says 55 minutes in total but when reading the recipe it says 10 cooking + 10 minutes before releasing the valve… Can you tell me which one is correct? Hi Kelen! The Instant Pot will take quite a bit of time to come to pressure, I’m estimating around 30 minutes for this recipe. I’m currently expecting a baby in 2 months and have been trialing new recipes for freezing and dumping. This one was super delicious and quick to make. I love the balsamic at the end which really brings the stew to life! I’m so happy to hear that! Good luck with the baby, Robyn! Can you make this in the crockpot? If so can you send instructions for using a crockpot ? Thanks! Just made this stew but substituted the potatoes with sweet potatoes. Super good recipe, can’t wait to make it again! Hi, there, I want to make this recipe but not sure, do I the carrots, celery and other ingredients first or put it straight in the pressure cooker? Never used my pressure cooker before an electric one so want to try this recipe using it for the first time. Hi Michelle, is your question do you need to cook the carrots etc first? If so, no you do not. Hope you enjoy! Hi Denise, I made this recipe , and it was so delicious and bursting with flavor. Thank you so much for sharing and I am looking forward to trying your other recipes. I’m making this one my all time favorite! I’m so happy to hear that, Amanda! Thanks so much for taking the time to leave a review, I really appreciate it! Great recipe! Made it last week and everyone loved it! Will definitely add it to the recipe book to make again!